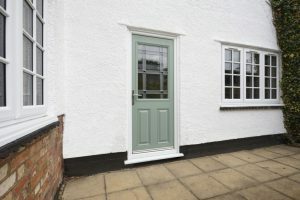 Main entrance to your home creates a strong impression to visitors and we have already improved the aesthetic appeal of many doorways across Hitchin / Milton Keynes, Luton and surrounding regions. There are a huge number of design options for you to choose from and contemporary deliver beautifully smooth operation and a long trouble free life as well as accommodating the latest locking systems. You may choose a fully glazed, part glazed style or maybe a fully panelled door. Beyond that is a multitude of door profiles (the decorative and sculptured elements of the door) which you can select to suit your taste and the style of your home. We can also accommodate your configuration preferences with doors opening inwards or outwards or creating wheelchair friendly thresholds. These are an excellent choice for external doorways. They are made of compression moulded GRP (Glass Reinforced Polyester) look like wood but are much stronger and last longer. Unlike timber they are impact resistant and will not warp. They are also stronger than uPVC although they also remain a very good choice for many homeowners. Free movement between the interior and exterior of your home means you can really enjoy outdoor life in the warmer months and we offer quality sliding uPVC Patio with 2, 3 or 4 panes and super smooth operation. In the winter they will provide fantastic insulation whilst you enjoy a good view of your garden. French ones provide a more traditional look to your property whereas sliding Patio are great if you have limited internal or external space for opening. 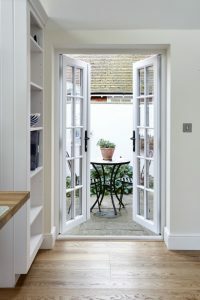 Many customers are now considering Bifold Doors instead of sliding options. Check out our gallery for work completed across Hitchin, Milton Keynes, Luton and surrounding areas.